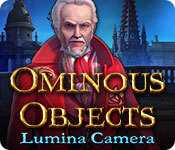 Ominous Objects: Lumina Camera is rated 3.3 out of 5 by 6. Rated 4 out of 5 by denniann2 from it was an ok game there is a custom level and a map which i didn't use because the hint system would tele[ort me where i needed to go. you have been asked to come to this town because people are disappearing and they want to know the reason why. you find out that an unsuccessful inventor has been kicked to the curb once again but he is approached by a man that said he could make all his dreams come true. the inventor builds this man a camera but it captures people souls and the man wants one hundred souls so he can leave his earthy vessel and rule the world from the world of negativity where those souls he captures go. Rated 4 out of 5 by alowan from A decent Standard Edition game I enjoyed the demo (of the SE, not the CE) enough to put it on my purchase list. I find the story to be original enough to keep my interest. I could play it in Custom mode, and as long as I can get rid of the sparkles and shorten the hint and skip times radically, I'm happy. I also found the lack of morphing objects, other things to find, and achievements delightful. I think I'll stick to the SEs from now on. At first, the phony French accent bugged me - but not too much later, everybody had what I think of as "Actors' Standard" ones, which I find acceptable. But since I found the music monotonous, I'll listen to Bach or Brubeck or someone while playing. That takes care of the accents! Yeah, I'll buy it! Rated 3 out of 5 by Granny_Gruff from One Star For Mr Jenkins! 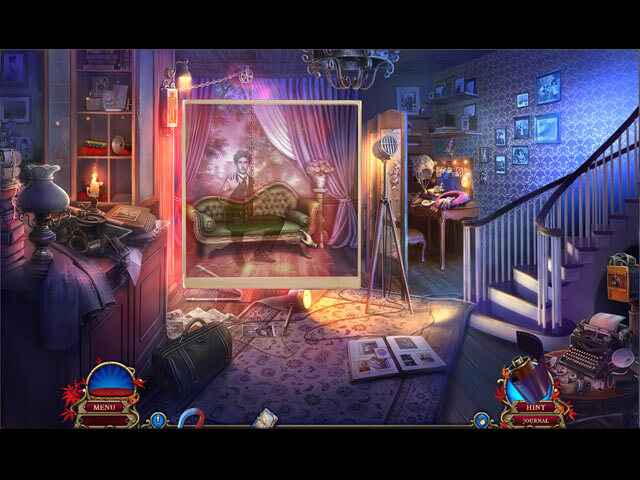 Once again Leia, youngest daughter from the first Ominous Objects: Family Portrait game is asked to investigate something strange with her faithful pet cat, Mr. Jenkins. They arrive to find the museum locked and a young woman, Morganna, who will serve briefly as an assistant. You will be investigating a camera that seems to have a sinister connection to its photographic subjects. People photographed by the camera are missing without a trace. Good Stuff: The game has all the game elements expected in an SE HOG and Mr. Jenkins as helper. Bad stuff: Little clarity in a scant story with muddled characterizations and incredibly average everything else. Once again we are presented a very bland entry into an established series that gives gamers little reason to play it through. Please try the demo before deciding on adding this game to your collection. Rated 3 out of 5 by Chickadees3 from Nothing really bad but nothing really good here either. When I first saw what the storyline is - a camera that traps the person in the negative world who's picture is taken - I was eager to see how it would play. It sounded interesting. Until I played the demo which I completed with 24 minutes to spare, so this may be a shorter game. The ball was dropped with the story. It could have been much better but it's just average. The artwork is very fuzzy which detracted from overall enjoyment for me. The voices are kind of ridiculous. I'm not British and don't personally know anyone who is but I imagine a British accent is very different from what's depicted in this game. Also, the screeching that Mr. Jenkins kept doing set my nerves on edge. The game mechanics is pretty standard except that it took 2 steps to use the map. First open the journal, then open the map, every time I wanted to use the map. I felt this was poorly thought out by the devs. Then we have the HO's and the mini games, both of which I actually liked. The HO's aren't your typical lists, which is nice and the mini games are varied and fairly easy. I found them to be relaxing enough that they offset how I felt about Mr. Jenkins screeching. Maybe the devs deliberately planned that, lol. I would recommend this game to newer players. Anyone who has been playing HOG's for awhile should probably wait for a better game to come along, as they always do. Rated 3 out of 5 by pennmom36 from Mr. Jenkins Is Truly The Star Of The Series I ended up purchasing Lumina Camera in the Collector's Edition when I needed a second CE to take advantage of a 2-4-1 sale. I started to play the full version this morning, but found myself distracted easily, straightening up my computer desk, getting up to pour myself some tea, I even unloaded the dishwasher at one point. The point is, the game just wasn't holding my attention, and to be honest, I'm glad that Morganna (your camera expert) went into the negative world! Her voice annoyed me, really annoyed me! It was so fake sounding, as if the woman who was doing her voiceover was trying to sound like a baby, yet she would pronounce the letter T in words that sounded prim and proper. All in all, this is just an okay game, neither bad nor good. If it weren't for Mr. Jenkins, this series would be nothing in my opinion. I'll stop complaining and get on with the review, lol. Gerald Dewitt was kicked to the curb and told he lacked talent and his inventions were worthless. As Gerald contemplates his life's work. worthiness, a stranger hands him a camera and tells him that his inventions will be limitless, but the time will come when the stranger returns to collect his dues. Gerald's camera does become famous, but for all the wrong reasons, the Lumina Camera captures peoples souls and traps them in the negative world. Leia Gofford and Mr. Jenkins have been asked to scrutinize the camera before the museum puts it on display, to be sure that the camera is safe for the public, but the Lumina Camera is not safe, it's most definitely an Ominous Object! My Jenkins is the star of the show, once again, using his four paws to investigate like no human could ever do, and soaring to heights (gently of course) of epic proportions to reach those items that somehow manage to find their way to the top of some really weird places. Equipped with your newest Ominous Object Camera, you will take pictures, and match photos to their original origins, the only way to break free from the cameras grasp is to align the photo with the victims inside to the exact place the photo was taken. In the Collector's Edition, there are 15 Collectible Photos located throughout the game and each scene has a Morphing Object, some of which are very difficult to find which leads me to believe that the game is non-linear and may require an action elsewhere's to activate the morph. There are also plenty of Achievements to earn in the Collector's Edition version. 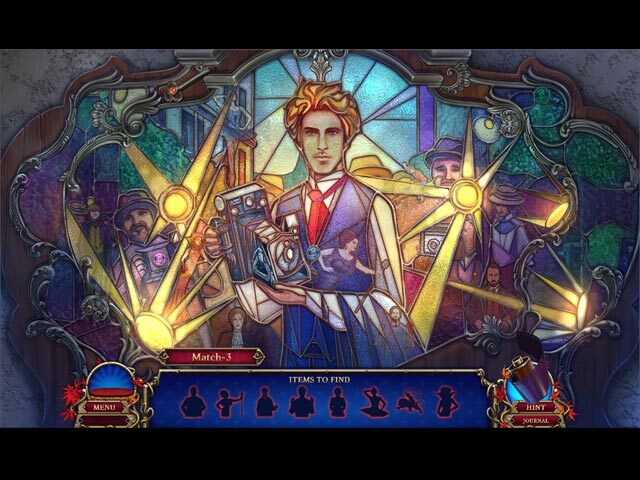 The Hidden Object Scenes are decent, and include smaller Zoom Zone puzzles where you find fragments that match the silhouetted shapes shown in the scene outside of the zoom zone. There are Multiple Finds, Interactive List Finds, Silhouetted Shape Finds, Matching Pair Finds and even Fragment Finds. 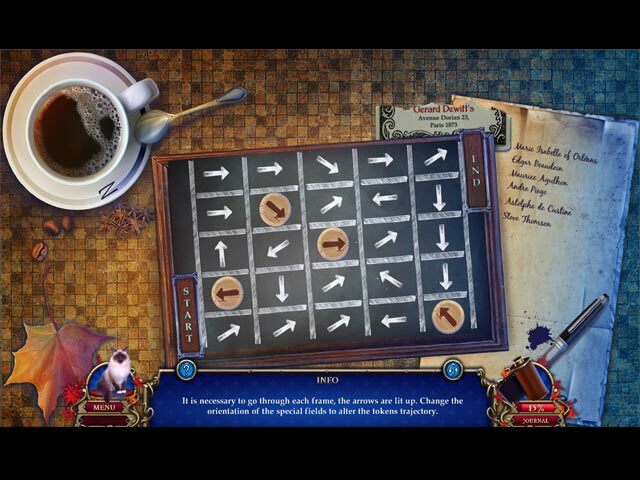 You can opt to play a Match 3 game instead of the Hidden Object Scenes. The Mini Games vary in terms of difficulty, most are doable and entertaining. The following are brief descriptions of some of the games you'll encounter during the demo: 1) Create a patch for the coin to travel from left to right selecting reels to move them. 2) Restore the picture using arrows to rotate the pieces. 3) Restore the photo by swapping tokens and using blue arrows on either side of the frame to make other tokens available. 4) Move the red block to the right, blocks can only be moved in the direction they are facing. 5) Create a path for the bird latch to travel through, by selecting and dragging deadbolts with the red circles to move them, moving one deadbolt affects others. 6) Move the figures so that their hand are touching. 7) Move the camera through all of the buildings within 7 moves. 8) Recreate the ship from the picture using arrows to cycle through your options. The Collector's Edition has 42 Morphing Objects, 15 Collectible Photos, 6 levels of Dots games, 4 Music Soundtracks, 8 Concept Art photos, 7 Developers Diary photos, 6 Wallpapers, a built in Strategy Guide and a Bonus Chapter. Because I'm not very impressed wit this game, I suggest you try the demo first, maybe it's just not for me, but you may feel differently.